Are you ready to go global with your home decor? Embrace strong colours, geometric patterns and beaten metals to imbue your space with exotic charm. If you’re looking to bring an exotic yet elegant feel to your home, you should consider the elegantly mysterious elements found in Moroccan style décor. 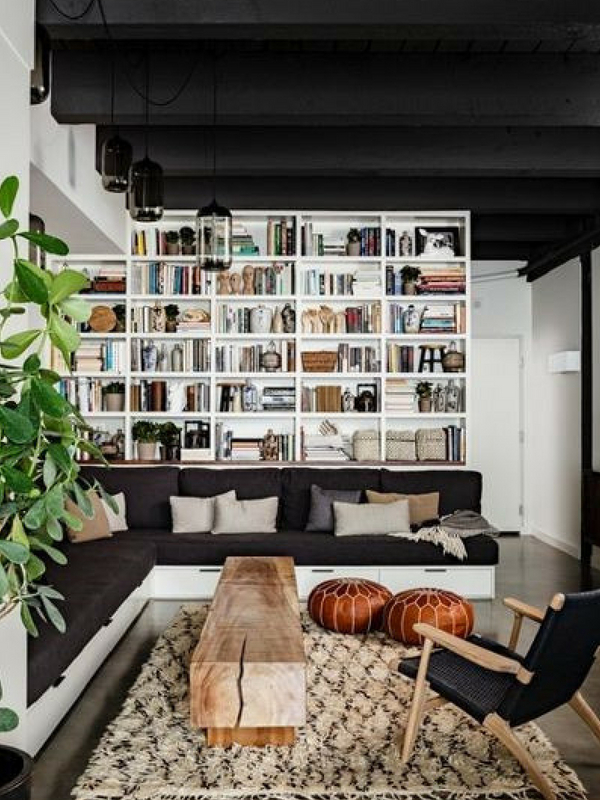 From vibrant colours to intricately designed wood and mosaic products, this luxurious, dramatic, and exciting style is becoming increasingly popular in modern homes. A trip to Marrakech is all about the senses, as you take in the mass of sights, scents, sounds and tastes that embody this exotic city. Colour is everywhere, and pattern is king. You’ll want to stop at each stall and sniff every spice, but the chaotic atmosphere and abundance of choice can be overwhelming. It’s all part of the experience. Moroccan design has been influencing our interiors for years, and ever since the internet made it possible to shop (and ship) furniture and accessories from all over the world. You can easily create a Moroccan-inspired space at home without ever visiting this magical place… though we really suggest you do. From the glittering coastlines of Casablanca and Tangier to the snake charmers and spices in the air of bazaars in Marrakesh. Inspiration can be found, whether you are looking for just a touch of exotic flair or a full make-over. No trip to Marrakech would be complete without venturing into the cavernous and chaotic depths of the souk. Take a map and your best poker face if you’re intending to snag yourself a bargain rug. 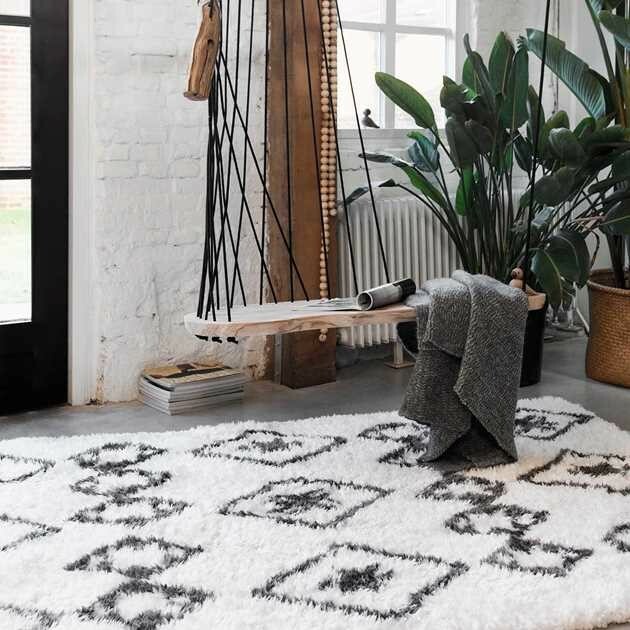 There are two main types of rug: kilims, which are flat-woven from cotton and wool and feature patterns made up of diamonds, squares and stripes. Also, ‘carpets’, which are still rugs, but with a long wool pile, often in more neutral colours than kilims. Style yours with natural wood and leather furniture for multi-textured appeal. 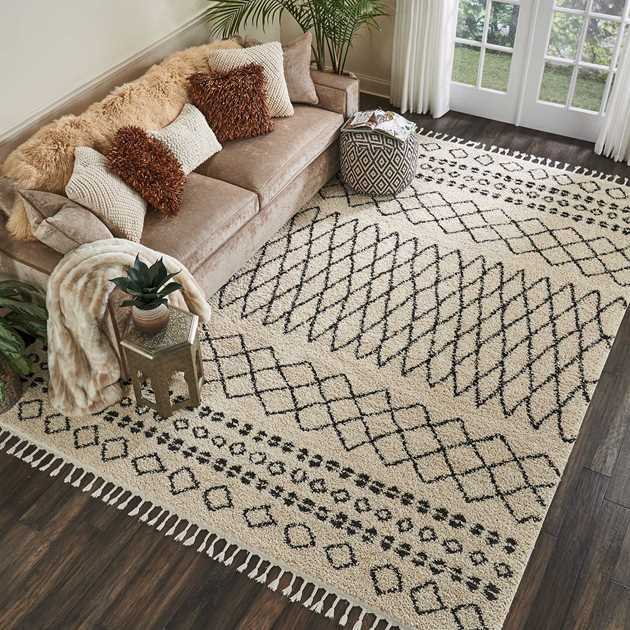 Floors of dark hardwood are covered with plush rug or beni rug and stacked floor cushions to create the perfect base for a Moroccan style room. Ceramic tile is often on used for flooring and gives a coolness much welcomed in the hot weather. Take a stroll down any shop-lined street in Marrakech and you’ll find skilled craftsmen selling beautiful lanterns. There are many designs available, but these spherical, patterned brass pendants are typical of the more contemporary offerings. Lighting is an important element of Moroccan décor. Moroccan lighting focuses on dim lighting created by lamps and pendants made from coloured glass, cut metal, and carved wood. Using candles in traditional lamps will add the romantic element of moving light to your décor and exotic scents. After experiencing the bustling streets of the medina, you’ll understand the need for a peaceful retreat away from the noise and frenetic activities occurring outside. Moroccan riads are houses designed to focus inwards, onto an internal garden with an open roof. 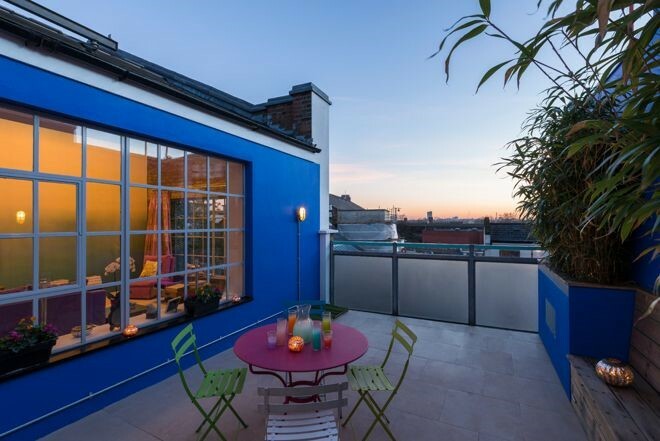 This space is surprisingly quiet, thanks to thick external walls and small windows. 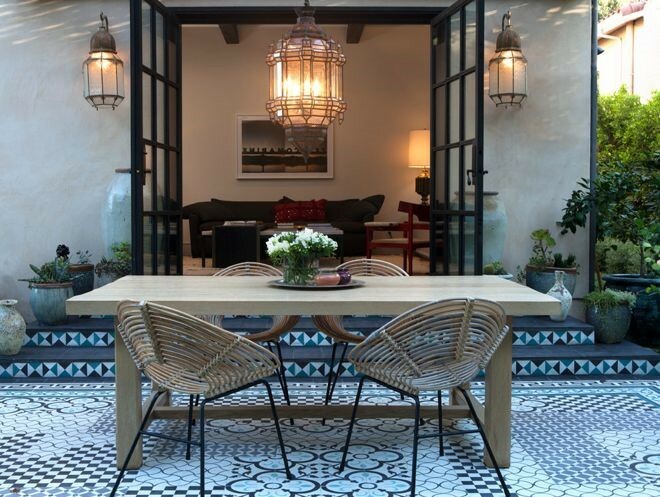 Create your own courtyard oasis with plenty of potted plants, bright patterned tiles and somewhere to rest and recuperate after a long day. If you crave rich colours from the darker end of the spectrum, look to Morocco’s leather goods industry for ideas. Put your feet up on a chic leather pouffe, like these tan numbers. Which enhance the natural tones of the wooden table and woven chair. This style is easily found online in the UK and often ships unstuffed, so be prepared for a bit of extra effort! Fabrics in rich colours with intricate textures and designs are typical of Moroccan décor. Add throw pillows and cushions in abundance, and drape luxurious fabrics from furniture, window frames and even the ceiling. Tie loosely draped fabric back with heavy cords in high traffic areas to keep them out of the way and for extra space and added style. Certain colours are immediately evocative of Moroccan décor, such as this iconic electric blue, which famously adorns every wall inside the Jardin Majorelle in Marrakech. Use this hypnotic shade in your own garden as a design feature in itself, as well as a foil for lush green foliage. 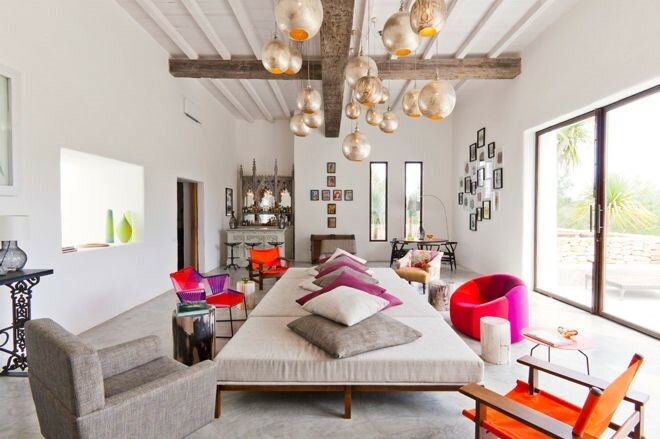 Bright colours are at the fore forefront of Moroccan themed décor. Where rich purples, oranges, and metallic are used in fabrics for a luxurious effect. For a fresh modern twist for summer, you could use bright and neutral colours while integrating within your home. A stylish way to embrace Moroccan design is to shape your scheme around a few patterned pieces. These plush pillows are a chic addition thanks to the neutral tones of mustard and purple. 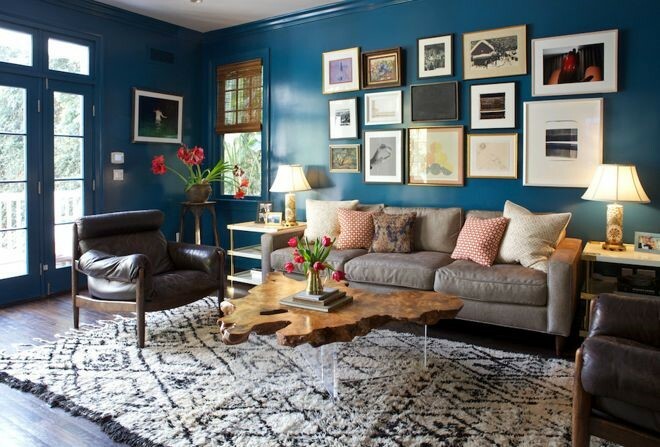 Which combine well with the beige of the contemporary layered rugs. Adding a feature wall of geometric patterned paper is just enough to tie all the elements together. Colour and pattern are the focal points of Moroccan decorating. Drawing inspiration from Moroccan’s landscape, look for shades of purple, blue and green from the Atlantic and Mediterranean. Also, look for shimmering gold and silver invoking the Sahara sands, and rich reds and oranges that conjure images of African sunsets. The bold colours and lively patterns of Moroccan design combine surprisingly well. Due to the clean lines and simple shapes of mid-century furniture. 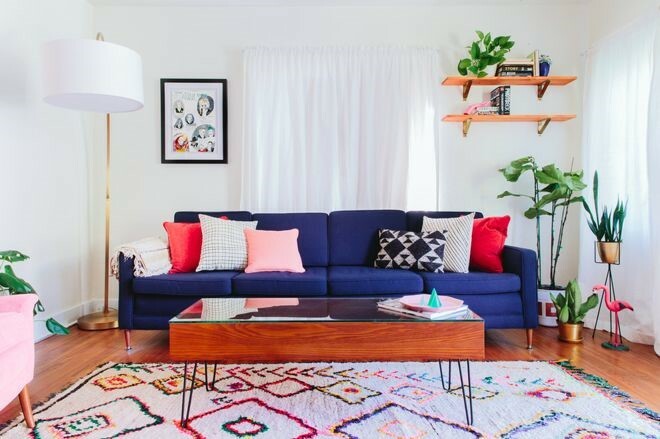 Here, a bright Beni Ourain carpet provides the inspiration for a living room full of eye-popping pink and purple pieces. The green foliage adds an organic element to ground the scheme. Interior spaces are busy in pattern but simple in furniture. Sofas and tables are inviting and set low to the ground. Moroccan furnishings rely on elaborately wrought iron scrollwork, mother of pearl inlay, ornately carved wood in high relief, richly hued upholstery, and intricate mosaic and terracotta tile details. Marrakech is a tile-lover’s paradise, with ornate courtyards and buildings hidden around every corner inside the medina walls. Happily, it’s now possible to source many Moroccan-inspired designs in the UK without the need for a prolonged bartering session. 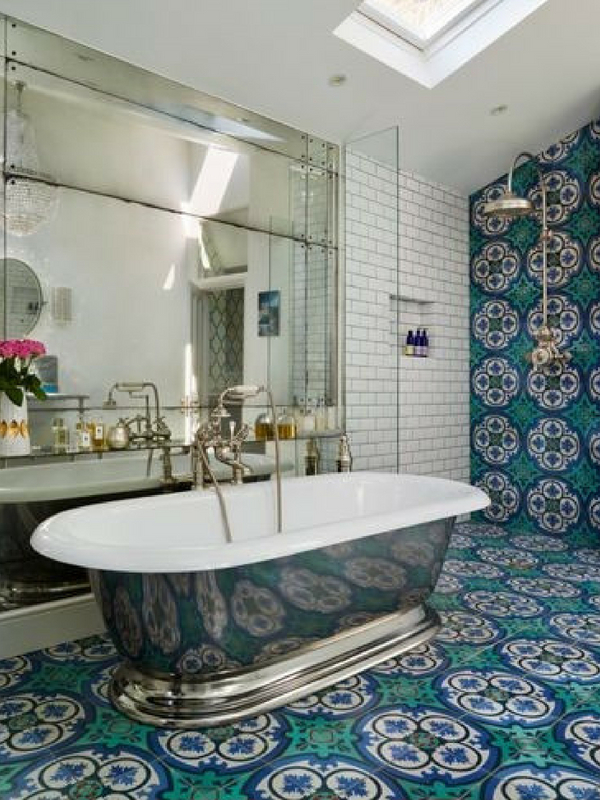 Traditional colours to look for in patterned tiles include black, deep red, green, turquoise, cobalt blue and mustard yellow. 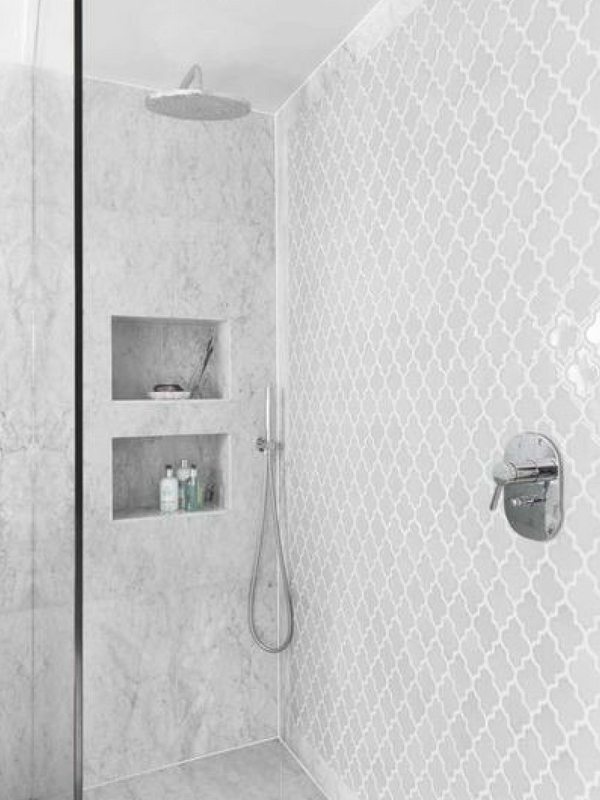 For a more subdued take on North African-inspired tiles, take a cue from the patterns of the region, but opt for a neutral, one-colour design. These dove grey arabesque offerings may not win many points for authenticity. However, they do pair perfectly with a marble bathroom and provide a hint of Moroccan flavour. Which elements of Moroccan style do you like most? Share your thoughts in the comments below, we’d love to know.